(Wo)Men Speak Out's Blog | Changing the face of advocacy. I remember scuba diving many years ago. It was late in the afternoon. My air tank was low. We hit a patch of dark, murky water. I don’t now when it started, but I rapidly lost all visual sense of where I was. I felt like everything was closing in. My heart started racing. I began breathing so hard that I felt like I was choking. I couldn’t tell up from down. I wanted to surface but I wasn’t sure which way the surface was. This past year reminded me of that sensation. Losing touch with the feeling of normal. We elevated the misogynist over a supremely capable female hand. I have no desire to list everything this man has said and done against women. My stomach starts to hurt just thinking about it. There is no reaction left in me. Only determination to show how I feel. To let our voices rise over the obnoxious early morning tweets. We march tomorrow. The reasons are self-evident. We are not doing this from our bubble. There is no case to be made for marching against everything this man stands for. We’ve spent enough time documenting every despicable tweet and every attack on normal citizens from the comfort of his powerful, cowardly perch. He craves our attention, only when it’s to massage his insecure, easily wounded ego. There is no pivot. There never was going to be one. Donald Trump will remain Donald Trump. He’s made his message very loudly and very clearly. He lined his Cabinet with Goldman Sach’s executives and rich partisans who want to dismantle the institutions they have been assigned to lead. We should have marched long ago. Now we march out of disbelief that this is happening. We are swimming in murky water, losing orientation. Not knowing up from down. Trump is losing us in his new normal but we can never accept that. After my panic subsided, I began to look around me. The water was still murky. I still felt lost. Then I saw the bubbles leaving my regulator. They gently flowed in the direction I needed to go. A march is like a stream of bubbles, awakening us out of our panic. Reminding us to find our center. To move in the direction of life before it is too late. When I found the waters edge I burst upward, pulled the regulator from my mouth, and breathed fresh air again. The breathe of life. So taken for granted until you realize you needed it more than anything. The time for panic and reaction is over. Now we march to protect our sense of respect and dignity. We march for women, but more importantly we march because this is our country and even Presidents need to reminded from whom they exist to serve. Chris and myself are doing a 30-day challenge that focuses on letting go of material items in effort to free ourselves from clutter, whether it be physical or emotional. Today brought up some emotions for me that I felt were worth expanding on. One of my items today is very personal. Years ago, I was at a trauma conference and came across a photographer whose work affected me greatly. She took photographs of the female form and cross-processed them with other images. One in particular was of a woman’s naked body covered in flames. I was immediately drawn to it, and purchased it from her. Through conversation, I learned that the woman in the picture was the photographer herself. Her self-portraits were a way of reclaiming her body after years spent in an abusive relationship. When she was finally able to leave her abuser, she burned the mattress that he’d raped her on and photographed it. 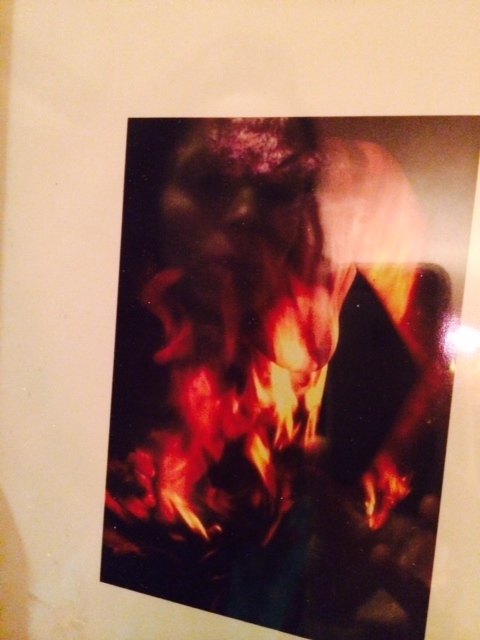 The two photos together were a way to express her pain and release it; to literally burn it away. It’s a compelling image with an even more powerful message. When I met this woman I was very early in my own recovery, traveling around the country and in the thick of trauma work. I would surround myself with visual reminders that I was not alone, that my pain could not be silenced. I felt like I needed people to see it, to talk about it, to acknowledge it’s existence, my existence. Today, while I was searching for my items to purge, I came across the photograph in a pile of old pictures and commemorative plaques of the past. It made me both sad and grateful. It’s still a beautiful picture, it stills has meaning. I realize now that I no longer need it in my life as a reminder of how far I have come, or my experience passed. I don’t relate to it in the same way, and I feel that by letting it go, I’m taking one more step towards healing. Maybe by letting it go, someone else will find it and walk a similar path. Which to me, makes gifting it….invaluable.